Our Vision at First United Methodist Church is to grow a loving community while we gather, connect, learn and serve. We do this in many different ways, as people have many different needs! Monday through Friday, our Christian Child Care Center cares for children ages six weeks to 12 years old, from 6:00 am until 6:00 pm. 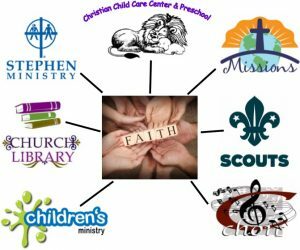 Tuesday evenings you will find all ages of Scouts meeting throughout the church building. Last spring, we celebrated five scouts achieving Eagle Scout status! Every day, we have Stephen Ministers caring for those hurting from illness, loss or just needing a caring listener. Sundays the church is alive with children enjoying their own time during service as they learn to become a follower of Jesus. Also, many talented musicians share their gifts to praise God and lift our spirits through song and music. Our church Library is filled with resources to elevate your knowledge of God’s kingdom and help you further your understanding of God’s Word, great books of fiction and many children’s books. Our Missions Outreach are the hands and feet of Jesus. Alpha Women’s Center, RAVE, Randy’s House, IM Third Meal, Baby Pantries, Ecumenical Food Pantry, local, national and international relief causes, Kids Coalition Against Hunger, missionaries,Forgotten Man Ministry, and Have Mercy are some of the agencies receiving support this year. Caring toward the greater world changes lives in ways we mostly won’t see. That’s called Faith. These are the ways we hope to make disciples of Jesus Christ for the transformation of the world.